Knights Armor Antique Copper Twist Pen Kit [PKA120] - $38.11 : AnkleBiter Woodworks, When all else fails, send in the dacschund! Here is the perfect gift to conjure up the knights, soldiers and kings of medieval history and the lore of the battlefields of the Middle Ages. The meticulously handcrafted components feature period armor adornment including a medieval sword, a hand riveted replica knights helmet with a dome recess on the end, plus a fluted armor design on the pen tip. Provides smooth writing performance with a Parker style refill. 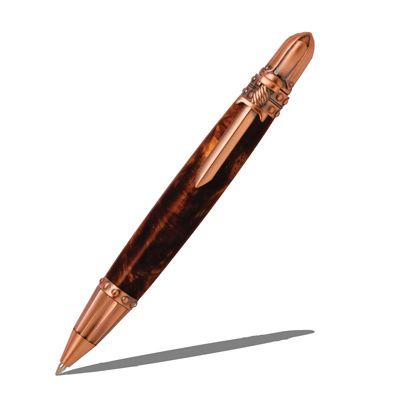 Plus, with its rich, warm copper finish and dark antique highlights, the details of this pen will surely impress.